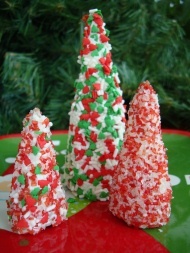 These Sprinkle Christmas Trees are so easy to make, and are also a tasty treat as well! This is a great Christmas craft for Preschoolers, and they can decorate their tree with any edible candy! 1. If you want your trees different sizes than the full sugar cone you will need to cut them down (you'll have to do this step for younger children). 2. Spread icing all over your sugar cone. Pour some sprinkles on to a paper plate or piece of wax paper and roll your cone until it's covered with sprinkles. Make each of your trees unique by using different colors and sizes of spinkles, mix them together if you want! You can put ornaments on your tree by sticking on some small candy like mini M&Ms. Yum, yum! These also look cute in the middle of a plate of Christmas cookies! The Busy Bee BUZZzzz You'll get the BUZZzzz on our new crafts, featured crafts for up coming holidays and seasons, AND learn some fun and useful tips for doing kids crafts - all delivered to your inbox from busybeekidscrafts.com. Your email address is totally secure, it is only used to send you the Busy Bee BUZZzzz.